Hats off to UIX designers. This does not come easy to me. I ended up purchasing Graphics (was iDraw) from Autodesk as it was affordable and comes with a rich feature set. A nice bonus is that this tool can generate can generate Core Graphics “copy as” code. Alas, my first pass works and leveraged the context menus to save on screen real estate. The context menu used canned icons. The start/stop implement the obvious functionality. 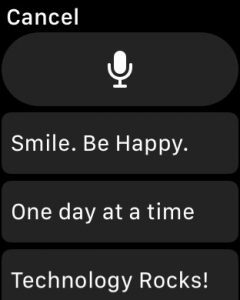 The Speak functionality allows me to either send one of three messages or speak into the watch and send the resulting text to display on my LED Vest. The user interaction side was rather easy to implement using the presentTextInputController method of the WKInterfaceController class. Swift extensions are your friend. One can extend classes without access to source and add additional behaviour. For example, to quickly implement alarm functionality, WKIntefaceLabel was extended to allow a refresh a label. Healthkit is a pain to get going using just Apple’s docs. Fortunately, there are lots of tutorials out there to help get things going. I would have liked to have more detailed information so one can track heart rate variability (HRV). These folks are working on some cool stuff mashing technologies using HRV. It seems we are left with BPM samples at around 5 second intervals. 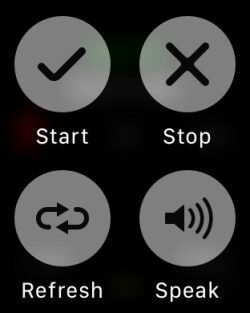 I get why, given that there could be other apps wanting access to this information and sub second resolution in a device that was meant to tell time at first would overwhelm watchOS. I suspect one day this should be available. I found Myo integration to detect hand signals easier to implement. It was more intuitive. On the Myo, the “home” position would be cached so relative changes in movement could be computed. e.g. right hand turn gesture using pitch and left hand turns using yaw and roll. It works quite well. I could not get this to function using that same approach with consistent results on the iWatch. I ended up working with just gravity component for hand signals position. e.g. right turn detection is using the X component of the accelerometer and the Y component for the left hand turn. Initially, I used CMDeviceMotion‘s CMAttitude component and used multiply(byInverseOf: x) method of CMAttitude to get relative changes in motion. It worked for the right hand turn but was inconsistent for the left hand turn. The gravity only component with a range threshold range works ok for now. I will investigate the CMAttitude further and will look at integrating (summing changes along X,Y, Z over small sample windows to detect hand signals. 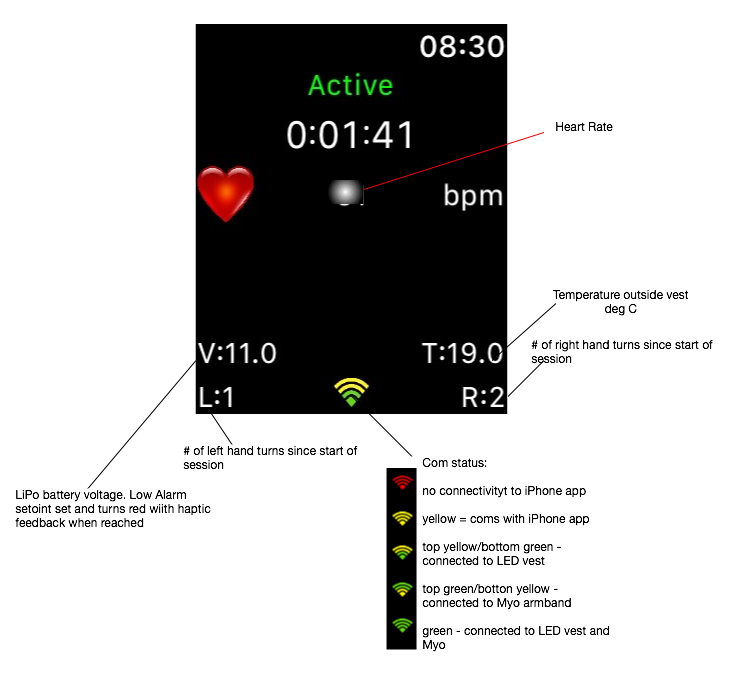 This entry was posted in Swift, Wearables by Peter Chrapchynski. Bookmark the permalink.